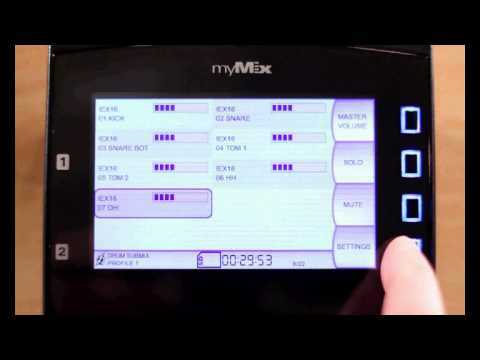 For best performance keep all myMix, IEX16 and myMix Control devices on the same firmware version. The zipped firmware update folder contains all files for the update and a pdf with instructions. Download and unpack the folder on your hard disk. myMix uses a "failsafe" update. Should you lose power or connection during the transfer, just start over, nothing will get damaged, as the new firmware gets installed in the first booting after the file transfer. 1-23:	First release, limited to 8 myMix, 16 channels, no IEX16, no play along, no send mix to network. Not compatible with any other version. 1-54:	Release, with best support for myMix Control. NOT COMPATIBEL to 1.51, or 1.45 due to new discovery for faster performance. 1-68:	Same features as 1.54 but with support for RX-2. If you don't use RX-2 you can stay with 1.54. Wait for the firmware update until it says: "Done. Please reboot myMix." 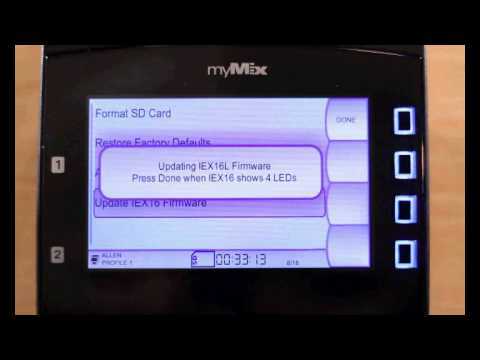 The next time you power up your myMix, it will start with the new firmware. 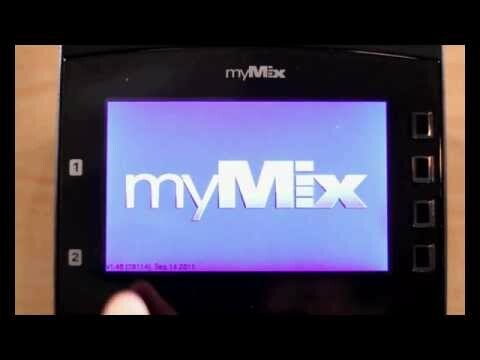 Connect to the myMix PLug and log-in as "admin". Scroll down to "Firmware Update" and click. Select the new .bin file on your hard disk and hit "Apply", you'll see the log-in screen showing the new version number. Wait 20 seconds and then power cycle the plug. 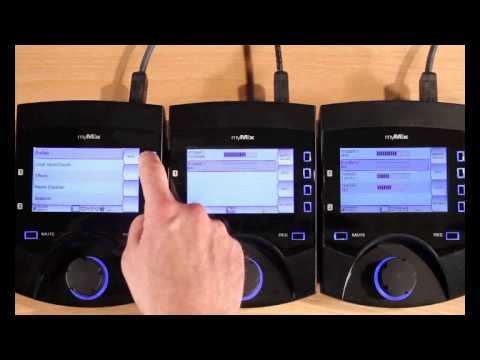 Here you find the latest versions of the manuals for myMix, myMix Install, IEX-16 and myMix Control. 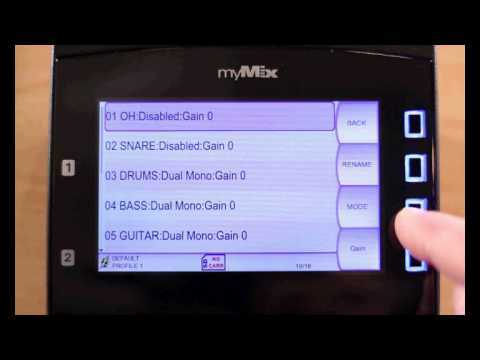 Cards SD or SDHC cards can be used in myMix for multi-track recording and play back as well as firmware updates. There are many cards available on the market, but not all work with myMix and not all achieve the same quality result. In order to work with myMix SDHC cards need to be compliant with the SDA 2.0 specification. 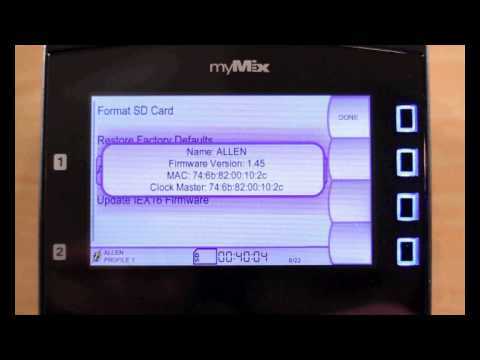 From firmware version 1.41 on, myMix will check SD cards for SRC entries. If these are not available, myMix will create an error message (CRC Error). In this case please use a different SD card (see recommendations below). The biggest card size supported in myMix for recording is 32 GB. UPDATE: We have tested also SDCX cards with 64GB and 128GB. While these cards do not get recognized for the first time when inserted into myMix, they can get formatted. 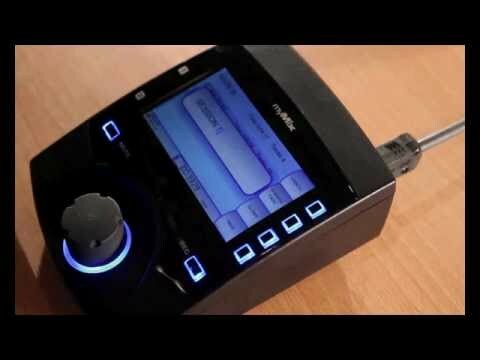 After formatting they are recognized and work like SDHC cards. IMPORTANT: For firmware updates SD cards should not exceed 16 GB. SD cards differ in performance such as reading and writing speed and quality of data (data errors in bad sectors). Especially recording onto a SD card is challenging. 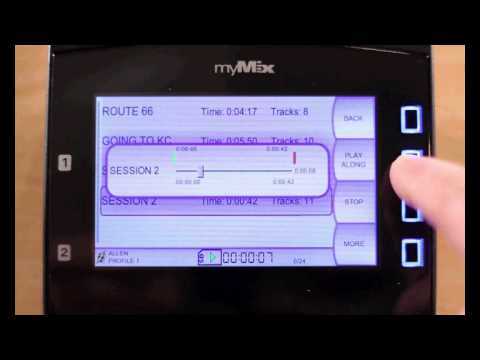 myMix can record up to 16 mono or 8 stereo tracks plus the stereo mix. As 24-bit / 48kHz time-stamped wav-files this represents a 1,152 kBits/s data flow, per channel, so nearly 21 MB/s. Also important are good sectors. There are software tools available to check the actual performance of an SD card, such as h2testware. **) we tested several cards of the same make, but we can't guarantee for them. Note: fpr firmware updates you need a SDHC card <= 16GB. The recording time is depending on the numbers of recorded channels and the size of the SD card. As an indicator a 16GB card can record 16 + 2 tracks for about 1 hour 40 minutes. Below some calculated values, the actual value depends on the individual card and is displayed in the myMix control bar next to the SD card symbol. 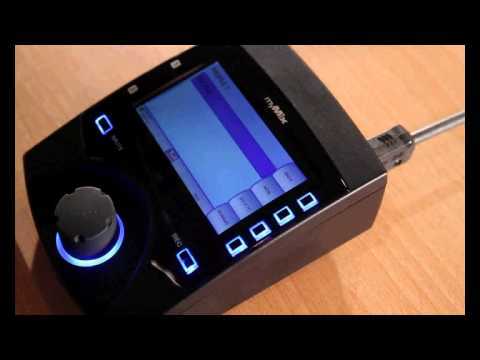 Click here for an overview of average recording time. Three or more myMix require an Ethernet switch (two myMix can be connected directly to each other). A myMix system with 16 or less channels, powered by the included power supplies, can use a standard 100Mb/s unmanaged Ethernet switch. 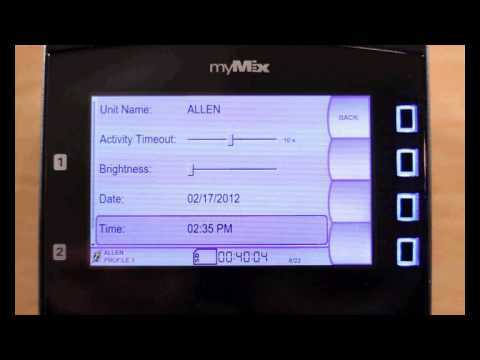 The switch will simply forward all the data necessary for myMix to operate. 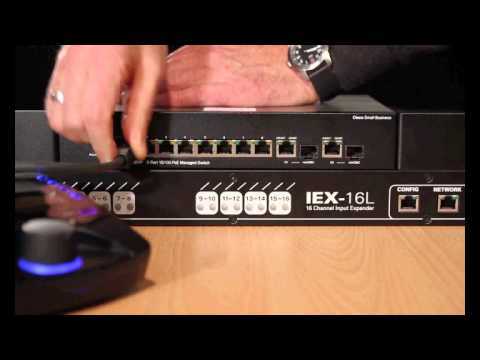 You can also use POE (Power-Over-Ethernet) switches to power each myMix. a myMix requires about 15 watts. 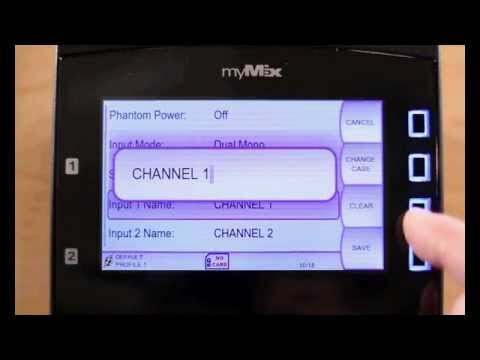 The best way to tell if a POE switch will power all of your myMix is to find the overall POE budget of the switch and divide that by 15. 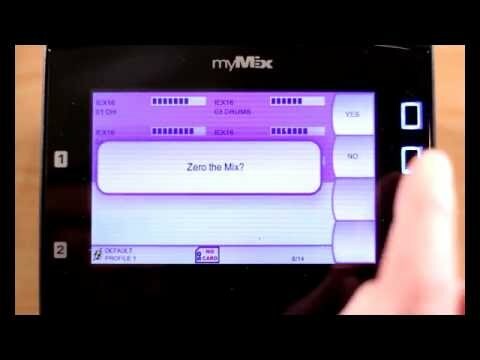 This will give you the number of myMix that can be powered by the switch. In case a switch has less POE budget (e.g. 60 W) than your number of myMix (e.g. 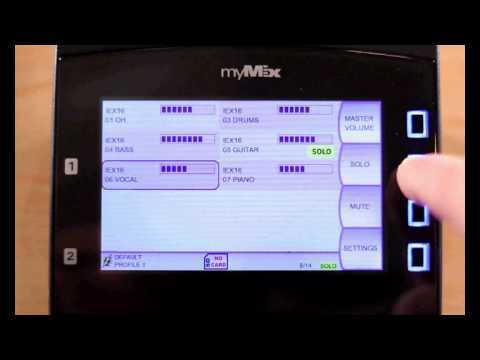 6) x 15, you can still use the external power supplied that ship with myMix to power the remaining units (e.g. 2). 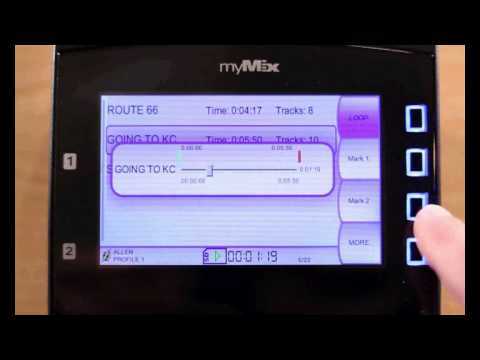 On a unmanaged switch you need to keep the myMix system exclusive and can't mix it with other traffic, as this might disturb the performance. 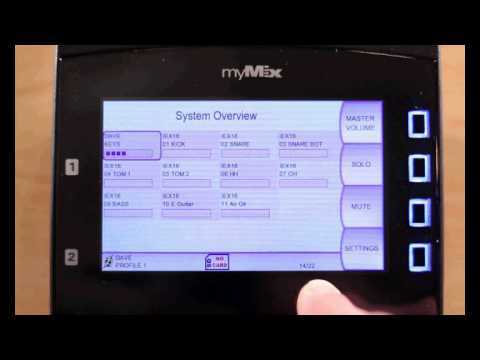 The current firmware allows a myMix network to contain up to 250 devices and manage a maximum of 500 audio channels. For myMix systems with more than 16 audio channels a managed switch is required. While unmanaged switches work with myMix plug-and-play, managed switches need to be configured. the myMix network uses two VLANs: VLAN 1 = discovery, VLAN 2 = audio and clock. Create a VLAN 2 (VLAN 1 is set by default). To allow proper synchronization (myMix uses PTP IEEE1588-2008, layer 2 transport), the clock needs to be exempt from filtering. If you plan to use multiple switches you need to configure a GB port on the switch as uplink to forward receive all data. 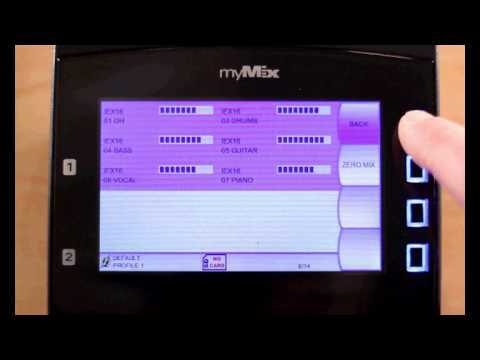 Note: myMix devices generate their IP addresses automatically (IPv4 Link-Local). If you are connecting multiple switches you must assign a unique IP address to each switch. If you integrate myMix in an existing network make sure VLAN2 is exclusively used for myMix devices. If you are unsure about all of the above: we offer pre-configured Cisco 300 series switches.See our product page switches for more details. myMix WAVE is a free software tool that allows you to create "Sessions" for multi-track playback in myMix from prerecorded material. The files need to be time-stamped wav files in 24-bit, 48kHz with the same starting time (length can differ). 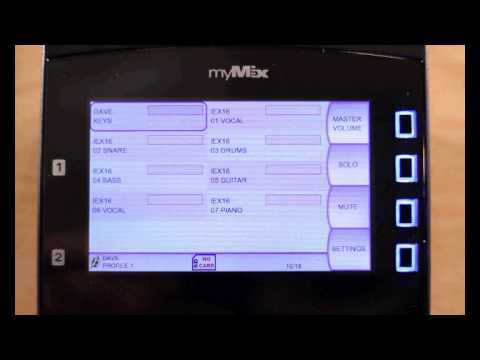 Here is a short quick start guide how to get started with a myMix system. There might be some topics that sound very easy or familiar to you and some that don't. Please take also a look at our tutorial videos (highlighted) as they captures many topics, step by step in one to two minute video clips. 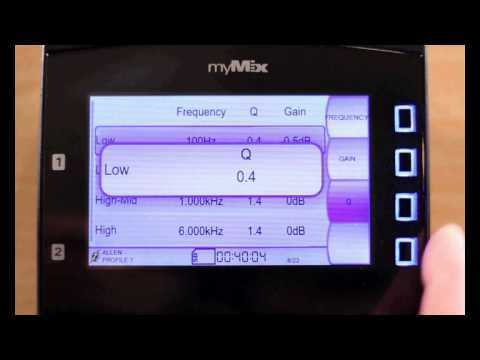 myMix can be used stand alone or integrated with any analogue or digital mixing console. 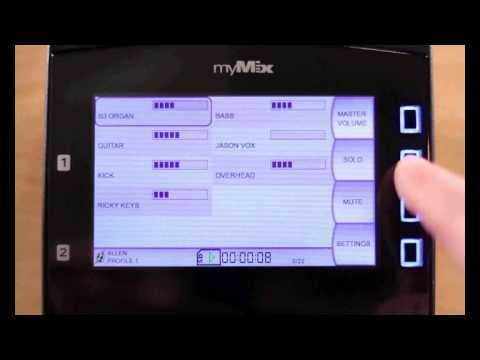 Here is an overview about the general input options for myMix. The donload below is showing these options in pdf format. 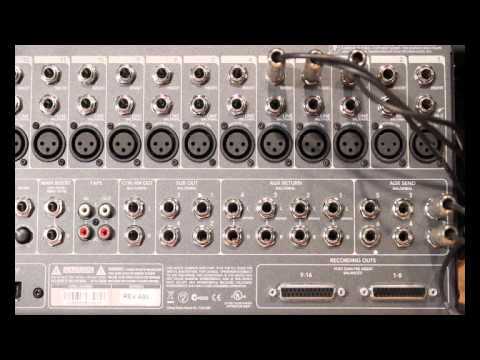 If you are looking for how to connect to a specific mixing console look here.